Brian quit his desk job, sold all of his possessions, and emptied his savings account to open a gym and pursue his passion. His investment paid off. Meet the 2013 BodySpace Spokesmodel! How Did Your Bodybuilding Journey Begin? I started working out in middle school when I was a short, chubby kid with braces. Weights helped me find my identity and build the confidence I needed for high school. I was always involved in sports, but never excelled until I picked up my first weight. I played baseball, football, and powerlifted in high school. Lifting turned me into one of the top powerlifters in the country. I won nationals and state two years in a row. When high school ended, I decided not to pursue sports in college. The active lifestyle I enjoyed fell by the wayside and social influences infiltrated my life. This led to a 40-pound weight gain throughout college, and it wasn't lean muscle. This lifestyle continued for a few years after college, too. Adjusting to the working world was a challenge. 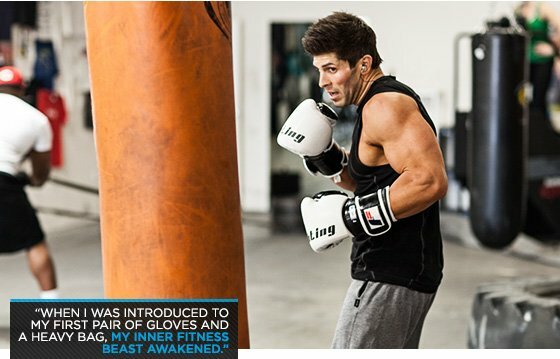 When I was introduced to my first pair of gloves and a heavy bag, my inner fitness beast awakened. I started working out hard again during early mornings, lunch time, and after work. My diet slowly turned around for the better. Instead of going out to eat with the office guys, I brought my lunch to work and prioritized my fitness lifestyle by ignoring outside influences. I got to a point in my job where I had enough and knew that sitting behind a desk was not my calling. So I quit my job to pursue my passion for fitness. I had no plan, just a passion. I looked into franchising opportunities with TITLE Boxing Club , which just started franchising the same month I quit my job. That was it. I sold everything: my car, furniture, and stocks, and emptied everything I had in savings to buy the franchise. I moved to Dallas and kept working hard to get my gym off the ground and my physique in top shape. I started experimenting with my workouts and saw big results. There was an opportunity to try out for a fitness video and I got the part. This was my introduction to the fitness world and I have been forging ahead ever since. I'm the new BodySpace Spokesmodel because I kept forging ahead, took a chance, and never gave up on my dreams. What Workout Regimen Delivered the Best Results? I train a combination of body parts each day with continuous movement. Typically, I aim for 3-4 sets with 5-30 reps, depending on the day. I always switch my workouts and challenge myself in new ways. I love cardio and do it at least three times per week for 45-60 minutes. My cardio includes boxing, hill sprints, plyometrics, regular sprints, long runs, and stair running. I do cardio every day if I'm preparing for photo shoot or a show. What Nutrition Plan Fueled Your Body? I drink 1-2 gallons of water daily. What Supplements Gave You the Greatest Gains? I take a pre-workout with a multivitamin and BCAAs, and whey protein in the morning and evenings. These helped me achieve my goals, but I've never been heavy into supplementation. I believe a healthy, well-balanced diet aided by supplementation helps you achieve the most. How Did Your Passion for Bodybuilding Emerge? My passion really emerged when I started my own gym and made fitness my life. This turned into a fitness video where I got first in the country out of 600 competitors and won the BodySpace Spokesmodel Challenge. This is my calling. I'm driven to inspire people to change for the better and live healthier lives. What Motivated You to Be a Bodybuilder? I see America as sedentary and unhealthy. America needs people to look up to for inspiration and motivation. I do it for them. Of course, I want to look amazing, but if it motivates someone who's overweight to do the same, that's my motivation. Where Did You Go for Inspiration? Watching myself grow and mature, and keeping track of my progress was serious inspiration. Watching the Biggest Loser and seeing lives change is very inspiring. Look around. Everywhere you look serves to inspire. Watching someone change and gain the confidence to live a new life is amazing. What Are Your Future Bodybuilding Plans? To continue making fitness part of my everyday life. Competing isn't everything to me; changing people is. As long as I can keep rocking, I will push my hardest to be the best I can so my passion can wear off on someone else. I don't know where my fitness career will take me, but I know it's going up. What Is the Most Important Bodybuilding Tip? Stick with it and never give up. Challenge yourself every day. If you feel a plateau looming, change it up, and reevaluate your steps to become what you always dreamed of. Dream big and big things will happen. If you fail, get back up and push harder. Be inspired so that you may inspire others, because you never know who is watching. Who Is Your Favorite Bodybuilder? Arnold Schwarzenegger, because of his distinctive physique and his definition of cut lines and the V-taper. He wasn't too bulky like many of the bodybuilders today. That's what makes him a true inspiration. How Did Bodybuilding.com Help You Reach Your Goals? Bodybuilding.com is an inspiration. Seeing people push past barriers and feed off each other's trials and triumphs to achieve their goals is inspiring. The level of motivation on BodySpace keeps me going. Trent Lootens is a small-town kid who has loved sports and outdoor activities his entire life. Trent always looks at the positives.